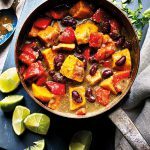 A Caribbean-inspired curry with loads of colourful veg that's perfect served with cauliflower rice. Mist a large saucepan or casserole pot with low calorie spray. Add the onion and cook for 8-10 minutes, until softened. 2 Meanwhile, place the ginger, garlic, scotch bonnet chillies, coriander stalks, spring onions and ground allspice in a mini food processor and blitz until finely chopped. Add this to the onions and cook for 3 minutes then add the sweet potatoes, kidney beans, red peppers, coconut milk and vegetable stock and season well. 3 Bring to a simmer and cook for 20 minutes with a lid on, until the sweet potato is just cooked then remove the lid and cook for a further 10 minutes, until thickened slightly. In the meantime, mist a wide pan with low calorie spray over a medium heat and add the cauliflower rice and cook for 4-5 minutes, until just cooked. 4 To make cauliflower rice, blitz the cauliflower in a food processor, then cook in a pan misted with cooking spray for 3-4 minutes. 5 Just before serving, stir the coriander leaves through the curry then divide the cauliflower rice and curry between 4 plates.